Pretty Charlotte, a lovely collectible bear! Charlotte has long multi-tonal light mink coloured plush combined with areas of soft cream. She has such kind eyes, does Charlotte, they'll melt your heart. She has subtly defined fingers and toes, and wears a sweet crocheted lace collar in cream, that has been embellished with a corsage of flowers in pearlescent pink and silver. 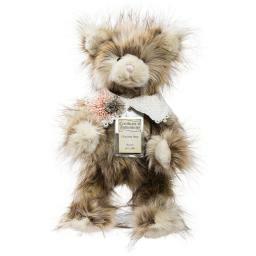 As with all the Silver Tag bears, Charlotte is fully jointed, substantially weighted, and has a classic hump. Charlotte comes with an individually numbered Certificate of Authenticity. She is 47 cm standing. Charlotte is one of 1500. She can be spot cleaned.